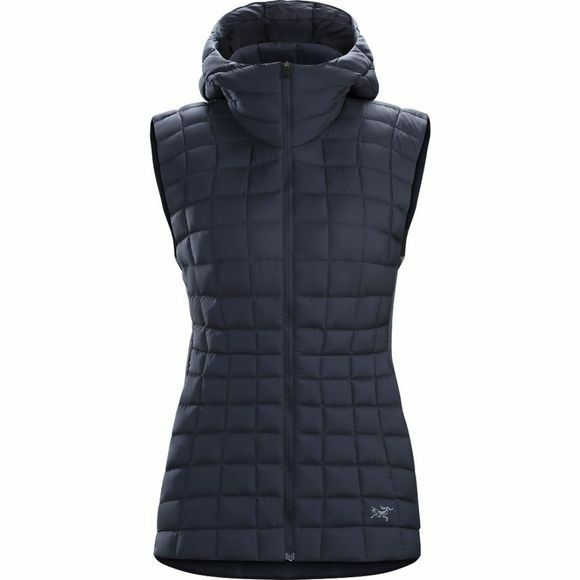 The Women’s Narin Down Vest from Arc'teryx is an easy choice for crisp days, it is a down vest with minimalist design, clean lines and a relaxed urban aesthetic. Warm 750 fill power goose down in the body and Polartec fleece underarm panels provide lightweight insulation with minimal bulk. A simple low profile, insulated hood adds protection from unexpected cold. Materials, construction and disciplined design give the Narin a minimalist appeal without sacrificing performance. The Bast nylon face fabric is a light, durable matte taffeta that resists wind and has a soft, silky feel. A durable water repellant finish is added for moisture protection while refined quilting and fleece panels on the sides streamline the look and fit and light elastic around the armholes smooth the Narin’s lines and seal out drafts.